Thank you for visiting the St. Matthew Orthodox Christian Church website. We invite you to join us for one of our liturgical services – services that have been part of the worshipping tradition of apostolic Christianity since the era of the “early Christian Church." St. Matthew is a parish strongly committed to the belief that the Holy Orthodox Church is the Church of our Lord Jesus Christ and His Apostles. Our parish is part of the ancient Greek Orthodox Patriarchate of Antioch where St. Luke in the Book of Acts tells us the believers were first called “Christians” (Acts 11:26). We are part of the global Eastern Orthodox Church community which includes national churches in traditionally Orthodox countries like Russia, Greece, Romania, Serbia, Cyprus, and the Middle East, but also in Japan, China, India, the Philippines, throughout Europe including Germany, France, Poland, Finland, across the British Isles, throughout the African continent including Ghana, Nigeria, Tanzania, Uganda, South Africa, and across North, Central and South America. There are over 250 million Eastern Orthodox Christians in the world today and over 1 million in the United States. Our parish is more than just a place where people come to worship the living God (although it is first and foremost that!). St. Matthew is a vibrant faith community of people of all ages and backgrounds who are working out their faith together and raising their families in accordance with the commandments of Our Lord and Savior Jesus Christ and the sacred norms for spiritual life of the ancient Holy Eastern Orthodox Church. Many of our congregants journeyed to the Orthodox Church from other Christian faith traditions and denominations and some non-Christian religious and spiritual traditions. Whether you are “on a journey” or just wanting to visit a local Orthodox parish you will be welcome at St. Matthew. We are always honored to have visitors join us for prayer and worship. We are located in the South Bay area of Los Angeles county. We are close to both the 110 Harbor Freeway and the 405 San Diego Freeway. Get directions. Come and see how the Ancient, First Church has been worshipping God for over 2,000 years! May God bless you. Daily services are offered Tuesday - Sunday. The times of these services and other special services can be found on our Services and Calendar page. We have one of the largest Orthodox bookstores in Southern California. Stop in and find what you need. Introduction to Orthodox Christianity and Catechism classes are offered weekly on Saturday at 3:30pm. This is an ongoing chance to help others less fortunate then ourselves. 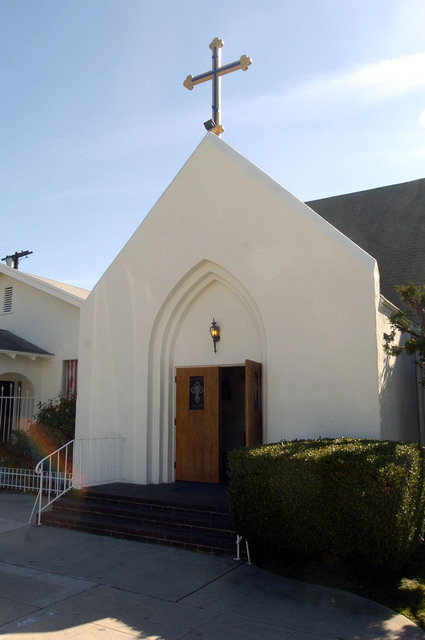 It is a meal provided once a month at Walteria United Methodist Church in Torrance. Contact Jim Ramirez for time, directions, or any other information. If you would like Fr. John to bless your home (house, condo, apartment, etc), please contact him. For a description of what to expect during the house blessing, please go to our Activities and Ministries page. St. Matthew was the son of Alpheus. From the Hebrew his name means the Gift of Jehovah. He was also known as Levi the Publican, a tax collector for the government of Rome in the Judean town of Capernaum. 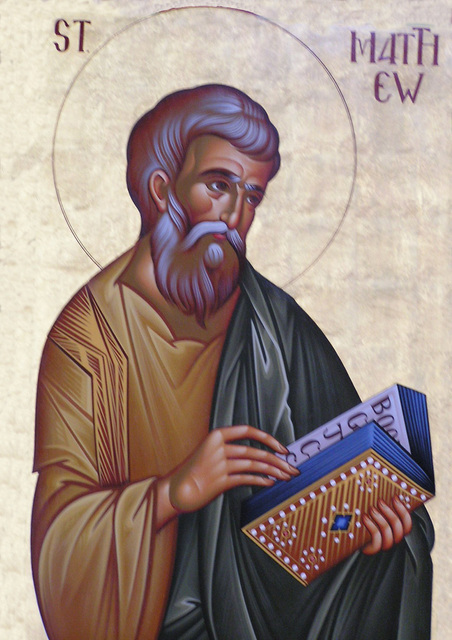 St. Matthew wrote the first book of the New Testament, the Gospel According to Saint Matthew. Here he wrote of the coming of Our Lord, the birth of Jesus Christ, the years of His preaching, the story of the Sermon on the Mount and the Passion and Resurrection. It is known that St. Matthew wrote the Gospel in the last quarter of the first century. St. Irenaeus and St. Clement of Alexandria tell us that after Our Lords Ascension, St. Matthew preached the Gospel in Judea for fifteen years. Tradition says he also preached in Persia and Ethiopia and stories of his martyrdom exist. You did hear the divine voice and received the light of faith, abandoning the office of publican. You proclaimed the Good News of the ineffable Kenosis of Christ, O Apostle Matthew and now you intercede that they who praise you be granted forgiveness of offenses and great mercy.